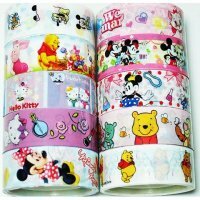 Disney and Hello Kitty Kawaii Mixed Deco Tape Set D - 10 rolls , Deco Tape : Decorative Tape , Stationery : Starscastle Online Shop: Cute Bags, Accessories, Kawaii Stationery, Cool Wallets, Fashion Jewelry & More! 10 different adorable designs in each pack - i.e. Mickey Mouse, Hello Kitty, Winnie the Pooh, & others, etc.